o From Olbia: take the highway S.S. 131bis and follow the signs in the direction of Nuoro or Cagliari. Drive along the S.S. 131 up to the 71 kilometres mark and turn off on the road to Dorgali. This car journey should take a little over an hour. o From Porto Torres: take the highway S.S. 131 following the signs in the direction of Macomer, where you turn off in the direction of Nuoro on the S.S. 129 up to the 131bis road. From here go in the direction of Siniscola-Olbia until the 71 kilometre mark and turn off on the road to Dorgali (24km after the exit for Nuoro). This journey is in total 173km. o From Cagliari: take the highway S.S. 131 up to the turnoff to Abbasanta and the 131bis. From here continue in the direction of Siniscola-Olbia until the 71km mark, turning off on the road to Dorgali (24km after the exit for Nuoro). In total 202km. 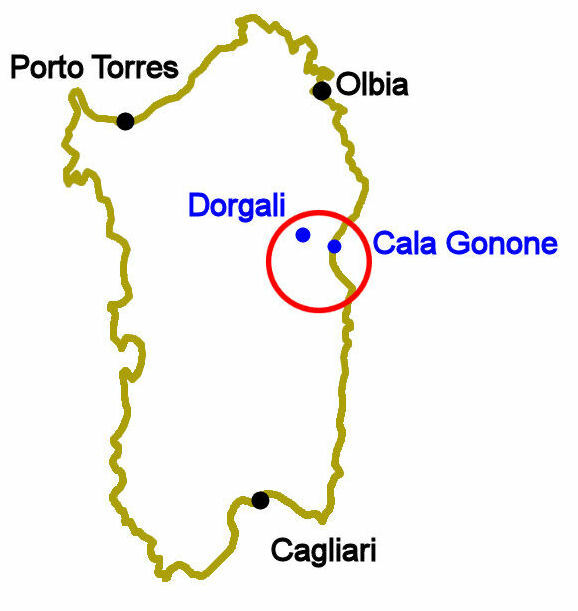 If you think you may have difficulty reaching Dorgali/Cala Gonone when coming to Sardinia by ferry or by plane, the Ghivìne Cooperative can offer transport for clients to Dorgali/Cala Gonone from every port or airport on the island. Just get in touch with us beforehand to arrange this.